One of the first artists I can remember falling in love with is Henri Matisse. I don't remember the details, but I do remember recreating one of his beautiful room scenes in Junior School. I loved the colours: red, blue, yellow, and the way the pattern on the wallpaper followed onto the table cloth. 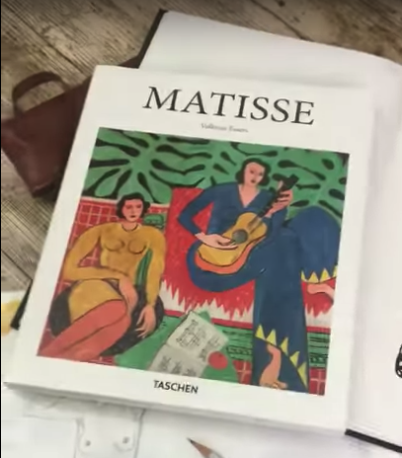 During my Masters I revisited Matisse's work along with a few other Greats and couldn't resist adding to my book collection. I love this book, it provides a quick source of inspiration and reminds me that I'm allowed to be lose and go with the flow. Sometimes I start with a detailed sketch as a way of looking and "taking note" of what's in front of me. This gives me the confidence to get loser and trust my hand, ink sketching a loser version with more character. Here I used my trusty pencil and Pentel water brush pen which I fill with Indian ink, along with my Seabright sketch books.